Happy Tuesday!! Spring seems to have hit our neck of the woods. It has been sunny and warm and I’ve been loving every second (I’m just praying it doesn’t snow again). I wore this transition look a few days ago and when my mom saw she told me she owned an almost identical sweater in the 80’s lol! Funny how trends always come full circle!! One of my fave looks of yours!!! Love that sweater (and that it’s on sale!) and those jeans! Uuu, I need your sweater, its’s such a bright and fun piece! I can see why this sweater is very 80s, love this look!! Your sweater and flats are absolutely adorable! Love these pieces together! Seriously love those shoes! 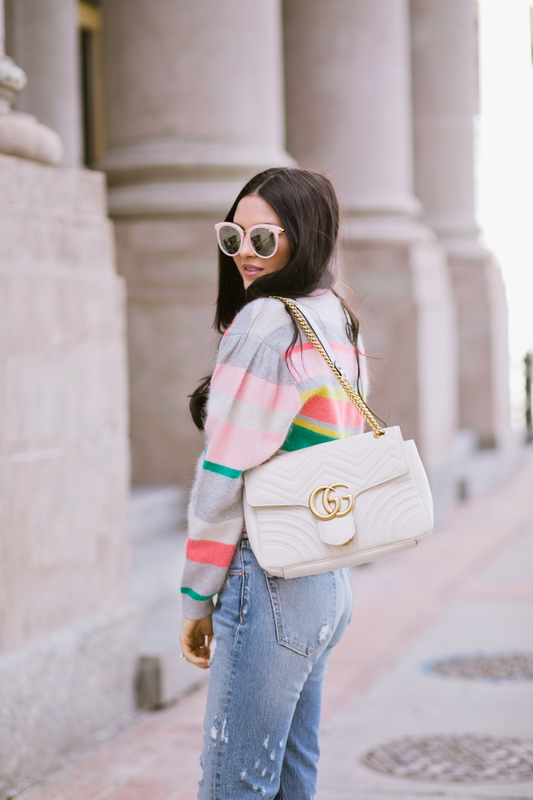 And that sweater is super cute for transitioning into Spring! Those mules are getting so popular, I see the all over NYC. I love those jeans & slides! 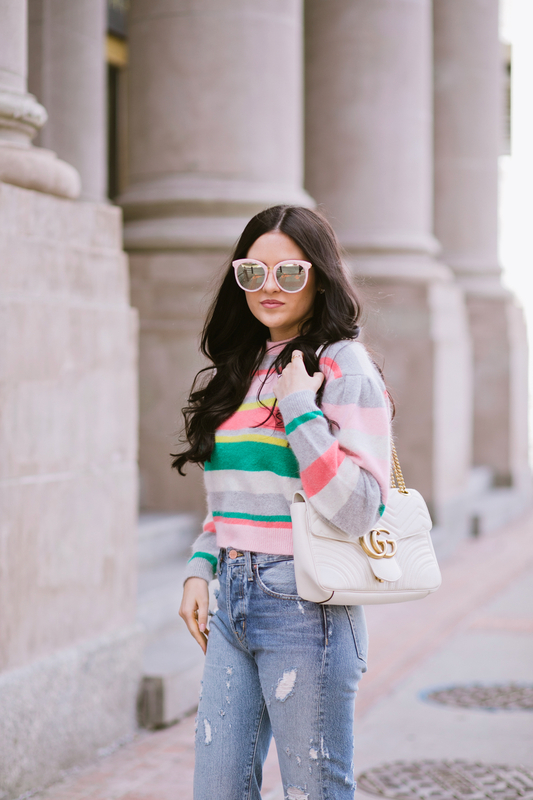 Super cute and great way to ease into Spring with some pastels! I swear I’m never getting rid of any of my clothes again because everything eventually comes back in style! Loving the stripes and your sunnies! This is such a cute outfit, Rach! I love the sweater and shoes especially. Enjoy the weather for me because here on the east coast, we’re getting slammed with a blizzard and though I love snow days, I’m so ready for spring! That’s what I heard!!! Be safe! Such a great outfit. I really love the stripes in your sweater and those flats are amazing! 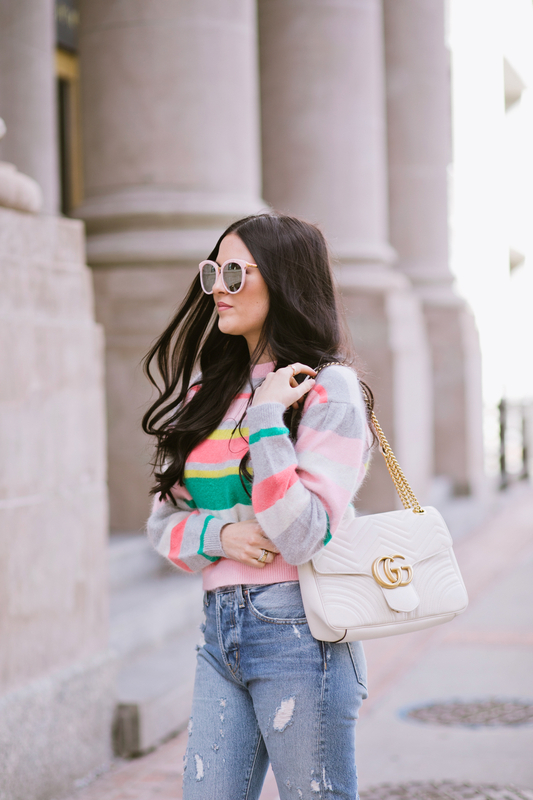 The colors in this sweater are perfect for spring! I would probably wear it early Easter morning :) I’m praying winter won’t come back either, I am loving these teases of warm weather and sunshine! This whole look is adorable! You look great in these colors! Ha! Funny about your mom owning a similar sweater. I showed my mom a handbag I want and she said she owned one just like it when she was younger. I wish she had kept it! I am seriously loving your outfit. 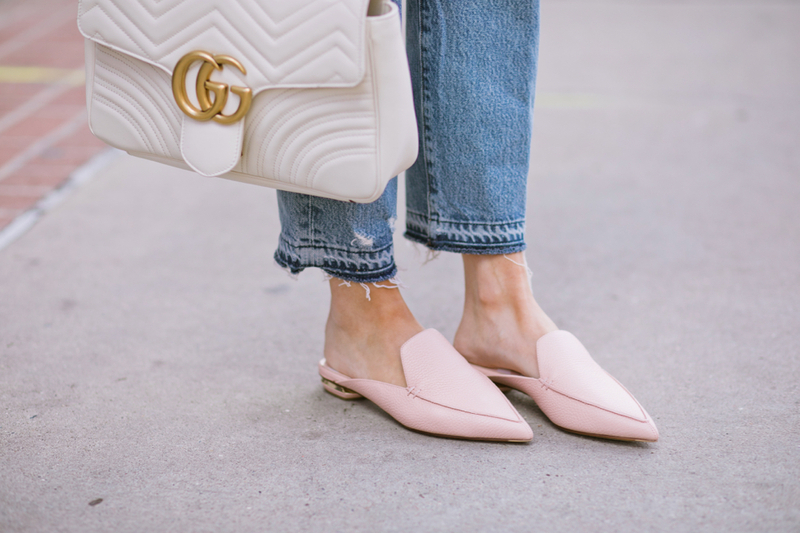 Those flats! And I need that sweater. Seriously all the great trends end up coming back, I swear!! Love this sweater .. so chic and so warm!!! I 100% agree! Thanks Sara! Oh my gosh I love this sweater so much that I think my eyes turned into actual hearts, like an emoji. It is so gorgeous. I now am adding it to any wishlist I can. haha your comment totally made my day!!! Glad you enjoyed the post! 1. love following you and your sis.. you guys are great!! That sweater reminds me SO much of the 90’s! Loving these slides! The color is perfect for spring. I am obsessed with those shoes! I need them in my wardrobe asap! Yes i think I had one similar in the 80s to. Loving those jeans! Mom jeans are THE BEST! Even if you’re not a mama yet! Also those slides! Must have! I love a casual look and that sweater is so fun! !